Mr. Ausdemore is currently in his second year at GCISD's iUniversity Prep as Director of Virtual Music. Prior to this role, Mr. Ausdemore has served eleven years as the Percussion Coordinator at Colleyville Heritage High School. In this role, Mr. Ausdemore served as the percussion coordinator, head of jazz studies, and co-director/composer/arranger of the CHHS marching band. Under Ausdemore’s direction, the Colleyville Heritage High School percussion program has flourished, gaining national notoriety through chamber music, guest artist concerts of all genres, recitals, and ensemble competitions. The percussion program has enjoyed competitive success at many levels, including the 2013 and 2014 gold medal for the North Texas Color Guard Association as well as capturing the 2008 Percussive Arts Society Marching Percussion title. Other accolades include the Percussive Arts Society’s “Call for Tapes” winners, the Percussive Arts Society’s Small Ensemble Champions, the Plano Drum Line Competition marching percussion champions, as well as the Lone Star drum line competition champions. In Mr. Ausdemore’s first year at CHHS, he launched the GCISD Percussion Club, expanding the students’ musical education and enriching the lives of over 80 GCISD middle and high school percussion students throughout the district. 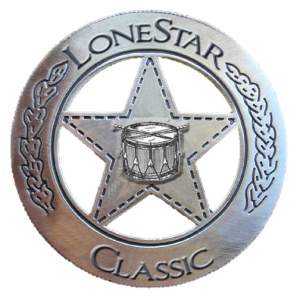 The GCISD Percussion Club presents master classes, clinics, solo and ensemble performances by local and regional professionals throughout the north Texas area. The GCISD Percussion Club has produced a record amount of students selected for the GCISD “Select Band”, the Region 24 “All-region Band”, the Region 24 “All Region Jazz Band”, and the Texas “All-State Band”. CHHS is proud to have produced several percussion students who have earned the national title for the Percussive Arts Society’s solo champion on several different percussion instruments. Mr. Ausdemore featured this unique pedagogical model at the 2009 Texas Music Educators Association Convention, in a clinic supported by Marimba Warehouse and Pro Mark sticks and mallets. Prior to his appointment to CHHS, Mr. Ausdemore taught at the University of Texas Arlington, as adjunct professor of percussion. In this role, Ausdemore served as the percussion arranger/assistant director of the UTA Marching Band, taught percussion pedagogy/techniques classes, assisted the UTA percussion ensemble, and maintained a full private studio as well. Mr. Ausdemore's performance background includes section and solo performances with several orchestras, wind ensembles, and percussion ensembles throughout the mid west and southwest United States, including the principal percussionist with the Texas Wind Symphony, and principal percussionist/assistant principal timpanist with the Las Cruces Symphony. In 1995, Ausdemore recorded/toured with Benson Records recording artists Nouveaux, compiling three #1 singles on the CCM music charts between 1995 and 1999. While living in Nashville, Ausdemore participated in many recording sessions, both commercial and proprietary albums. As a clinician, Mr. Ausdemore has given performances, clinics and workshops throughout the U.S. at several Percussive Arts Society’s “Days of Percussion”, including Arizona, Tennessee, New Mexico, California, Arkansas, Colorado, the Percussive Arts Society International Convention (Columbus, Ohio 2002, Indianapolis Indiana 2009, 2011) and the International Horn Society Convention (Beijing, China 2000). Ausdemore has served as a featured clinician at the 2009 and 2011 Texas Music Educator’s Association Conference as well. In addition to teaching/performing, Mr. Ausdemore has composed/arranged, instructed and consulted with numerous Drum Corps International drum and bugle corps, college marching bands, and high school marching bands throughout the United States, including the Blue Knights, Cavaliers, Phantom Regiment, Limited Edition, Northern Aurora, and Southwind. Ausdemore has served as music director/composer for the Insignia Percussion Ensemble. The Insignia Independent Percussion Ensemble participated in the Winter Guard International circuit locally and regionally, winning the 2004 NTCA gold medal in their inaugural season. Mr. Ausdemore currently serves as a music and percussion adjudicator for Drum Corps International, as well as many other regional marching band and percussion circuits throughout the United States. Mr. Ausdemore's professional affiliations include the current Vice President of Percussion on the executive board of the NTCA, a marching percussion committee member for the Percussive Arts Society, the Texas Music Educator's Association, the Texas Bandmasters Association, and the American Society of Composers, Authors, and Publishers. He holds a Master of Music degree with distinction from New Mexico State University (2002), as well as Bachelor of Music degree with high honors from Belmont University (1999). Jeff Ausdemore lives in Bedford, TX with his beautiful bride, Pam Ausdemore. In addition to Pam's pageantry background with the Phantom Regiment, Southwind drum and bugle corps and the Pride of Cincinnati winter guard, Pam is a phenomenal art teacher at Sendera Ranch Elementary School in Northwest ISD. They have been married since May of 2012.